When the weather warms up … what to make for dinner is an issue for me. Son #3 thinks that we don’t have Tuna Pasta Salad often enough (even though he picks out the celery) … he will ask “Is today hot enough for Tuna Pasta Salad?” Today the answer is … Yes, will you be home for dinner? When I want to make something quick and easy in warm weather … this pasta salad is one thing that I rely on. I make it in the morning … put it in the fridge, so that it will be nice and cold for dinner. Mix tuna and lemon juice in pasta. As pasta continues to cool, prepare remaining ingredients. 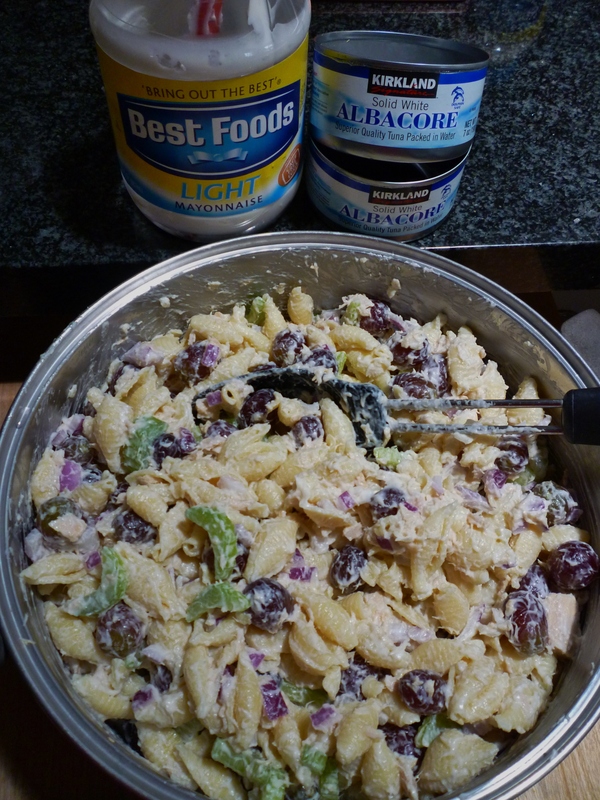 Add celery, onions and grapes to pasta … mix well. Chill. Serve cold (with hot bread according to my guys)! Oh … we all like to have leftovers for lunch, too! This time the salad served 3 dinners and 5 lunches! WHAT DO YOU MAKE FOR DINNER IN HOT WEATHER? I ♥ YOUR COMMENTS! I LOVE tuna! I need to try this! You’re right, nothing’s better than a cold dish on a hot day. Pinning to try soon! Glad I found your blog today on the Time to Sparkle party, now following you via Facebook. Come visit me sometime! Mmmm…..sounds yummy. We have tuna salad once a week,I want to try your recipe~Thanks! I have tried it and I love it. Thanks. What a delicious salad. I cannot wait to make this one for lunch! Thanks for sharing. I love having leftovers so easy lunches the next day. I am right with you on wanting cold food on warmer days. I like your addition of grapes a nice little sweetness and added crunch. This pasta salad looks fabulous! I am funny when it comes to warm days, I like to eat cold foods, but for some reason I like soup too…go figure! I think the children would like this salad a lot. Thanks! I love pasta salad too when the weather is warm. We just had some last night for dinner. But I only add vegetables, and no tuna. This sounds so good, I’ll try your recipe next. 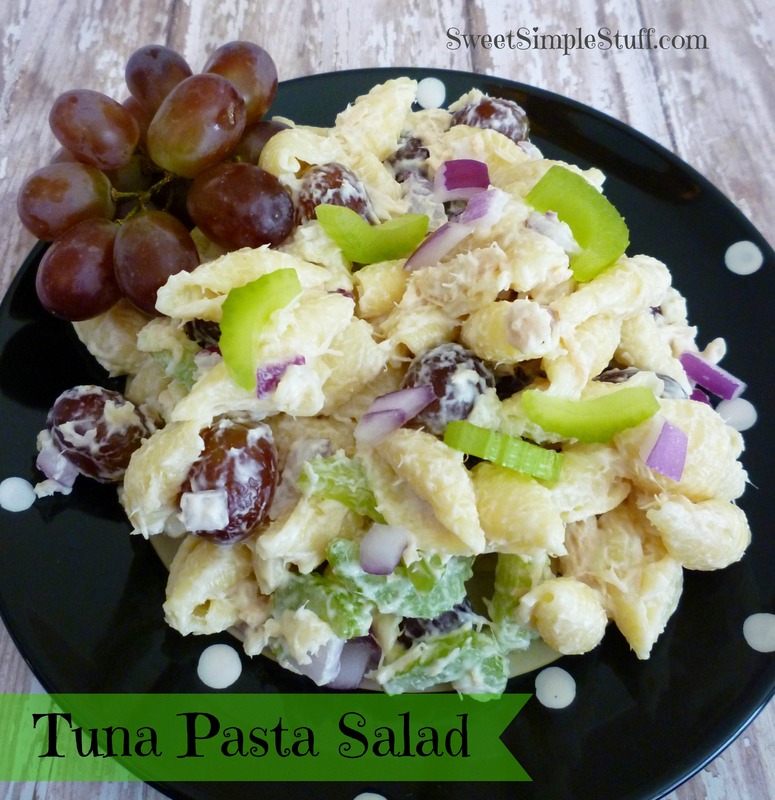 Tuna salad is a great dinner choice for hot nights! This is awesome….I used to get this in fanuel hall when I was working in Boston. Great for a hot night!!!!! I was making this salad from memory, and never added the lemon juice. I want to make it tomorrow, as I made once for my brother when he was visiting, and he is with me again and ask about it. I will add the lemon this time – this is such an awesome salad, I eat it for breakfast, lunch, dinner and in between as snack! Thank you for posting!!! Thank you Ewa 😉 The tuna pasta salad is a favorite summertime meal here, too … made it for dinner last night!